For my beautiful niece’s sweet sixteen, I wanted to make her something simple and fun! I saw this idea on Pinterest, so I decided to make it for her! It’s sparkly and fun to match her amazing personality! 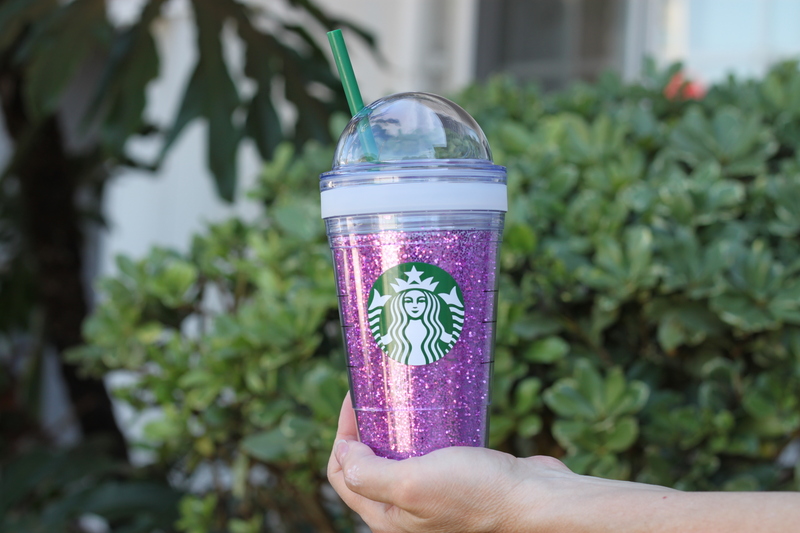 *I also purchased a separate dome lid for the cup, since Alyssa enjoys whipped cream on her Starbucks, but this is not necessary! Ok, here’s the deal. After following this tutorial, I honestly wasn’t impressed with my results. 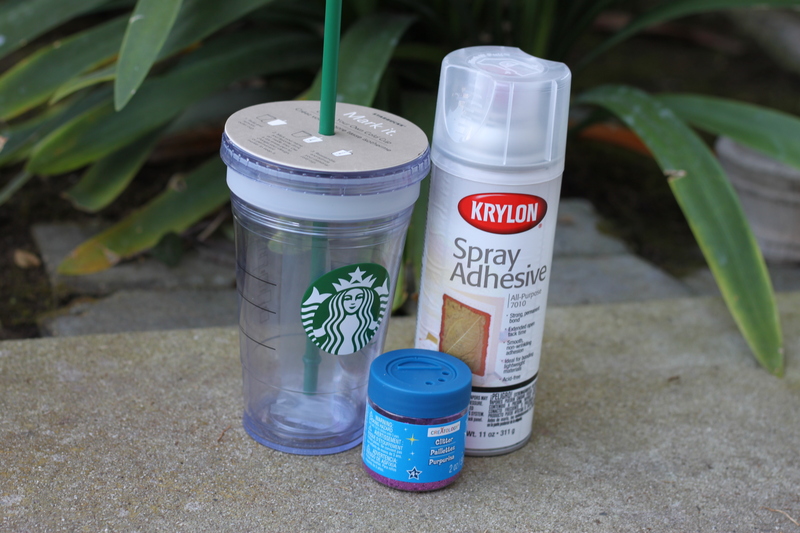 Because the tutorial instructed me to spray the adhesive on the inside of the outer cup, my result was a bit cloudy. I don’t know if I sprayed too much or what, but after that, I decided to try to do it a little differently! 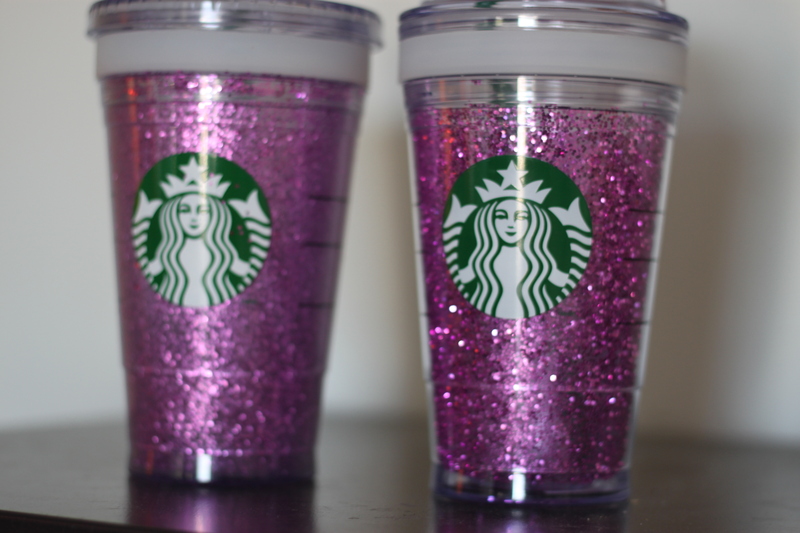 I had to purchase another cup, but I wanted it to be perfect for her, so this time I actually sprayed the adhesive on the outside of the inner cup instead, and applied the glitter that way! 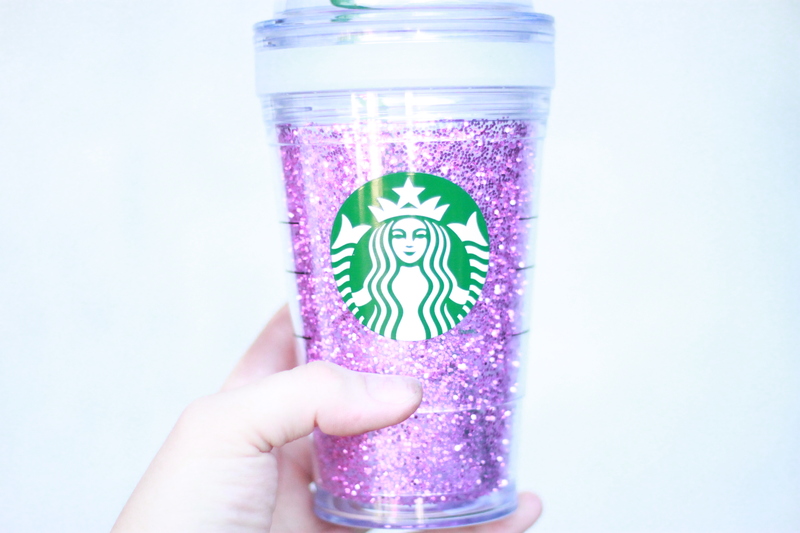 By applying the glitter that way, then inserting it back into the outer cup, the glitter was much more sparkly without the adhesive clouding it. Here’s a picture of the two different ways side-by-side so you can see what I mean! The left cup is the original way and the right cup is my way. I then applied Super Glue to the threading of the two layers, so if she wants to hand wash the cup, she can without getting any water between the two layers. I was much happier with the results, and I can’t wait to give it to her! While my parents were visiting this weekend, I thought it would be a fun little project to make a canvas print with my Mom for baby J’s nursery! I’ve been wanting to do some footprints for him, so when I saw this idea on Pinterest, I decided to do something similar! Since J just turned 6 months, it was the perfect opportunity to use his tiny little footprints to make a piece of art for his wall. We started by sectioning off the canvas with tape into thirds, then stenciling the ages we chose in each section with the paint and sponges. 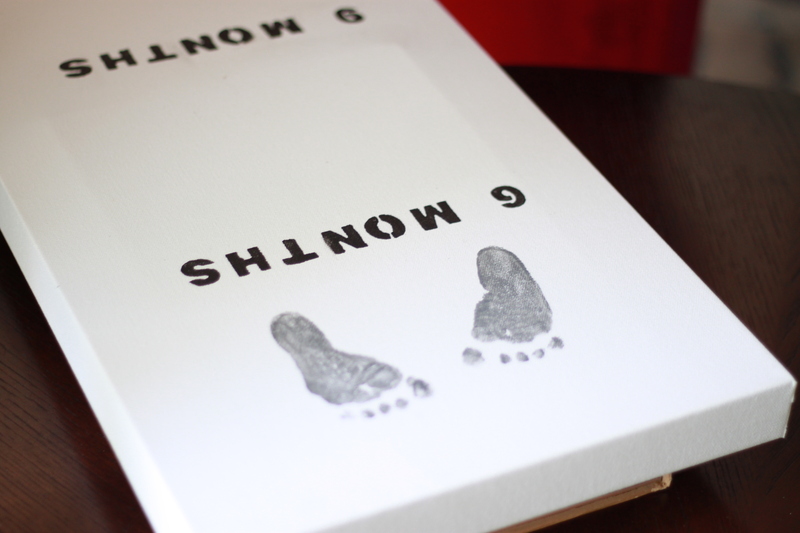 After that, we put a light coat of paint on J’s foot and practiced on scrap paper first. After finding the best amount of paint and the quickest way to get his foot on and off the surface, we went for it on the canvas! I had considered doing a foot and hand print, but after practicing with the foot, I realized at his age, a hand print would probably get very messy, very quickly and not give the outcome I was hoping for. There are so many variations you could do with this, from the ages to the paint colors and even the layout! This is what worked best in J’s nursery, and I couldn’t be happier with our simple color choices! I think it turned out SO cute and it was so special to make it for him with my Mom! I find that the slight imperfections and blemishes add character and will remind me of the fun we had making it. 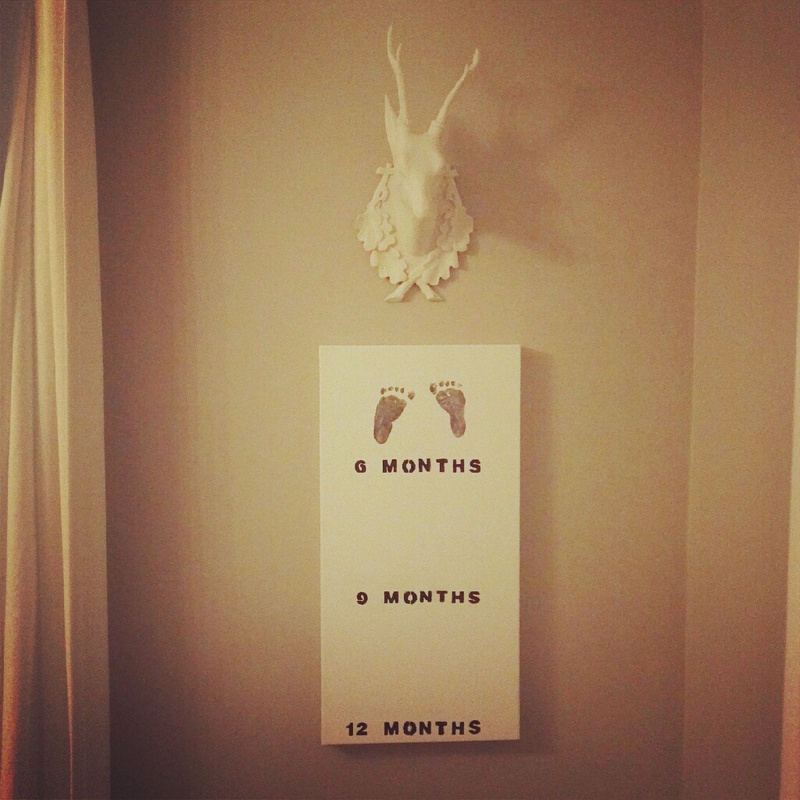 I can’t wait in three months to add the next set of footprints to see just how much he’s grown! 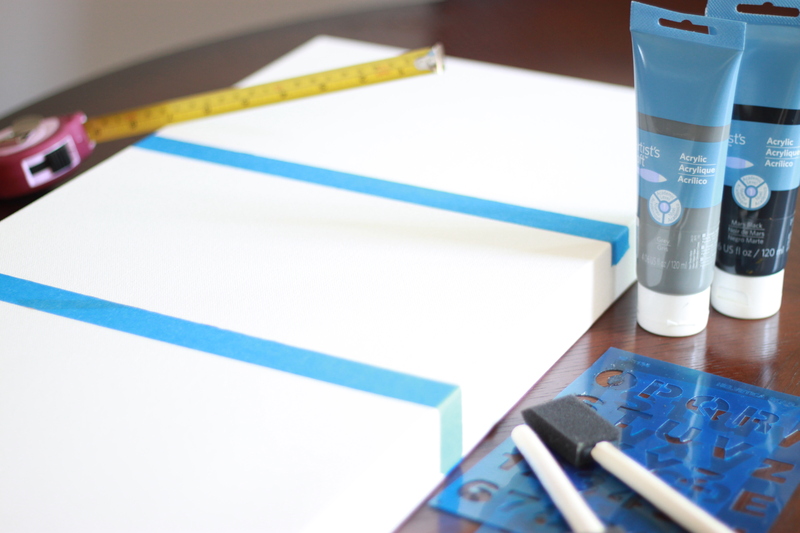 Ok, this is the easiest DIY project ever! 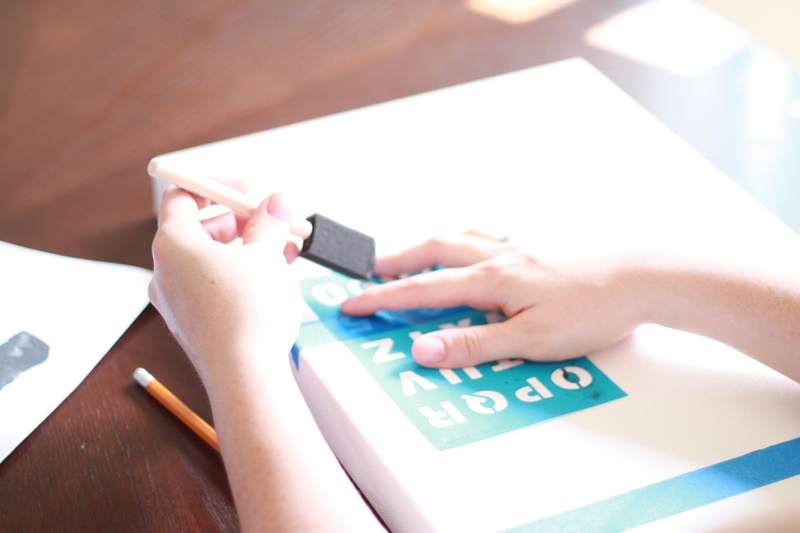 All you need is: a sharpie marker, coffee mug, and just a tiny bit of creativity! 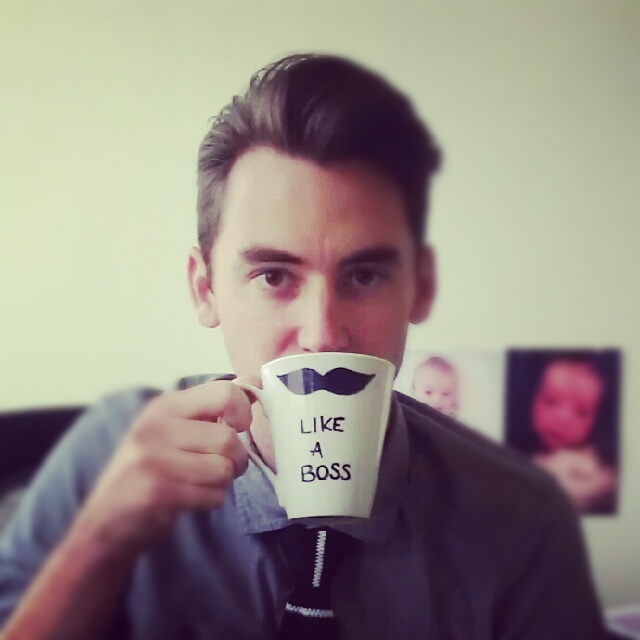 Brendan and his co-workers use the phrase “like a boss” quite frequently, and in light of Brendan’s recent promotion, I decided he needed to have it on a mug for his daily coffee. We actually already had plain white mugs, so the cost was nothing! It was super easy, I just drew the design with a sharpie, then fired the mug in the oven at 200º for 30 minutes! Here is the tutorial I followed! As many of you know, I have some Japanese in my family heritage. 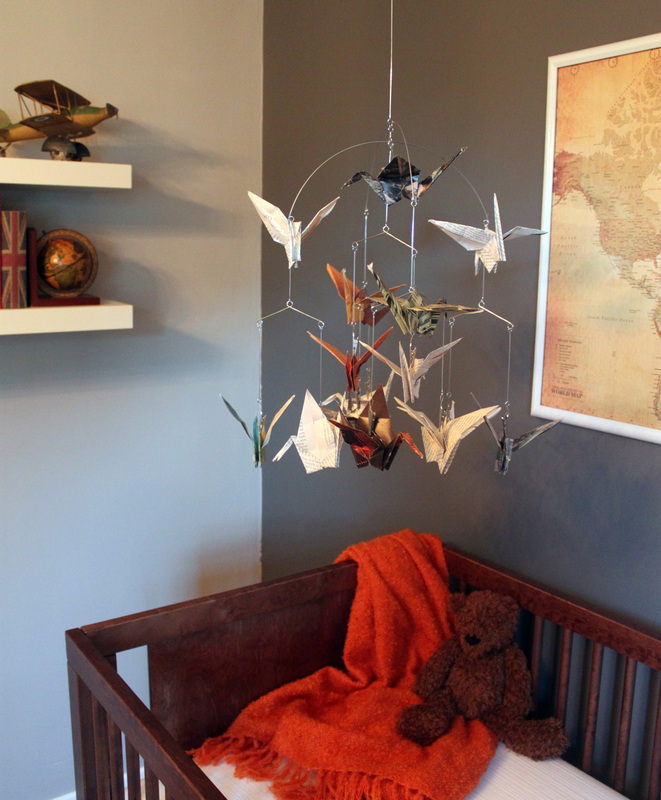 So, when I was trying to come up with an idea to hand-make a mobile for baby J’s nursery, I couldn’t think of anything better and more beautiful than peace cranes! I have seen many already made for sale on Etsy, but since I wanted to make a personal touch (and had plenty of time to do so, since I was on bed rest), I decided to make one myself! 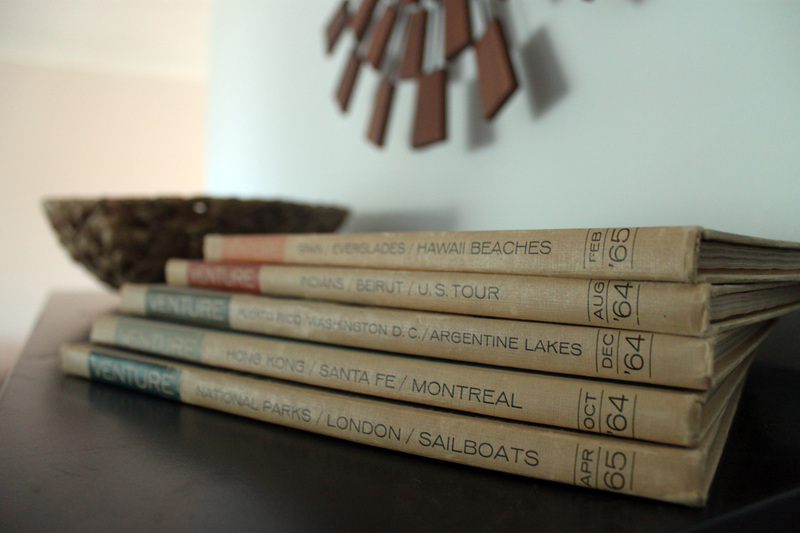 I have a few old Venture traveling books from the 1960’s sitting on my bookshelf, so I decided to use some of the pages from the books to create a more worn/vintage look to the cranes. I picked some pages with mostly text, some with big colorful ads, and some with maps. For the colored pages, I chose to go with mostly burnt oranges and light blues to go with the colors in J’s nursery. After watching a tutorial on YouTube on how to fold a peace crane, I practiced on some scrap papers until I felt confident, then started folding away! 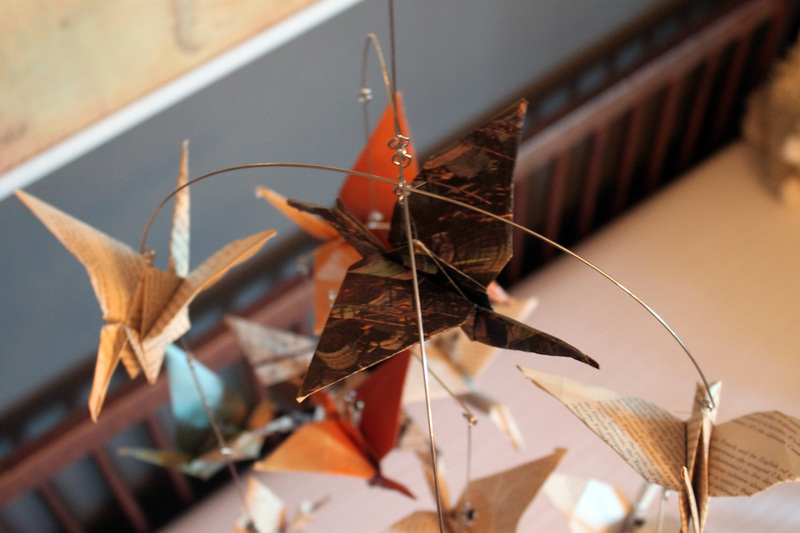 I was deciding between several ways I wanted to hang the cranes, but thanks to the supply from a great friend of mine, Kelli, I decided to use a photo clip mobile! Although it doesn’t have any flashing lights or play any melodies, baby J loves it!! He just stares at it, smiles and talks to it! I’m so happy I decided to make it for him, it was actually very enjoyable and relaxing, and gave me an opportunity to sit and daydream about my sweet, little baby that would be laying in his crib, enjoying it in just a few short weeks!